Like Ms. Lawson I’d put roast chicken high on that feel-good list, just as I would this recipe for rösti with fried eggs (which comes from the current issue of Bon Appétit). 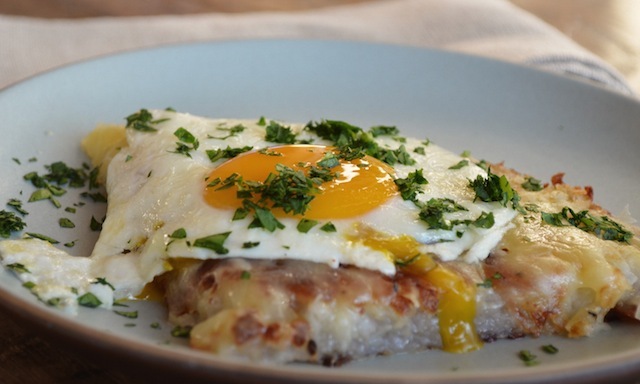 Now unless you’ve had some experience eating your way through Switzerland you’re probably wondering what rösti is; the answer is simple: a very large potato pancake or hash-brown patty, topped (in true Swiss style) with melted raclette or Gruyère cheese, and crowned with a fried egg (and a slice of salt-cured ham, if you’re up for it). The combination is seriously good, like that one really excellent mouthful of egg, potato, and ham you experience when the various components are cooked to perfection and you get the proportions on your fork exactly right. Of course, hash browns are one of those basic dishes that almost no one knows how to make exactly right (and by that, I mean golden and crunchy on the outside, soft but not mushy on the inside). Which is, in-and-of-itself, reason enough to try this recipe. Because even if you forgo the cheese, the ham, and the egg, you will, at least, have learned how to make THE PERFECT HASH BROWN. And that, my friends, is one skill you will be glad to have mastered. I was anyway. The secret, as with so many dishes, comes down to a few simple steps. 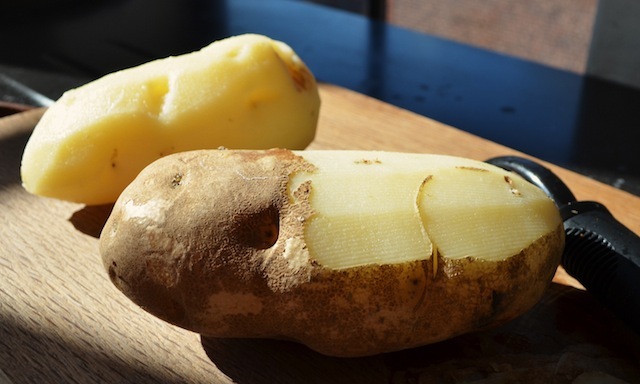 The first and most important is parboiling the potatoes, until the tip of a sharp knife can be inserted easily a 1/2-inch or so into the flesh—a process that takes between 8 and 10 minutes. This is key because the potatoes are ultimately to be exposed to a second cooking, so keeping them a little underdone at this stage ensures they won’t be the consistency of baby food when delivered in the form of a pancake. The next step involves chilling the potatoes in the refrigerator for a few hours once the parboiling is complete. This may seem inconvenient, even cruel if you’re hungry, but it’s vital. Why? 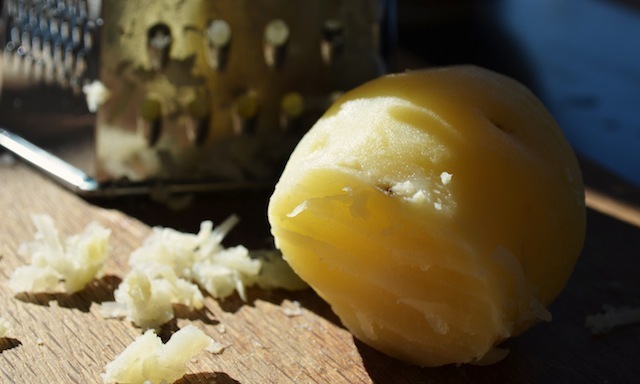 Because it allows the potato’s flesh to retract, which makes the grating process easier and the resulting potato shavings more likely to hold their shape, both immediately off the grater as well as once they’re fully cooked. 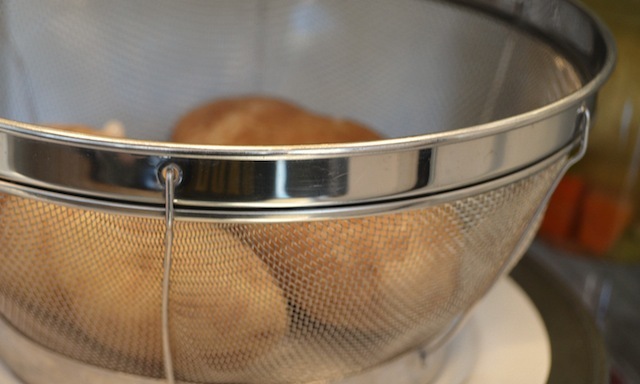 Of course, the actual frying of the potatoes is an equally critical step—a process marked more by what you don’t do (stir, or otherwise fuss with the pancake) than what you do do, which is basically to let the potatoes cook undisturbed over medium-low heat for 20 minutes or so until the edges look crunchy and golden brown. First, though, melt a generous quantity of butter in an ovenproof skillet (nonstick ideally—just make sure it’s oven safe) then add the potatoes, along with the salt and pepper. Next, gently press the mixture with a spatula until it’s uniform and spread evenly across the base of the pan. At this point you can pretty much walk away, though a few return visits are necessary to gently shake the skillet, just to ensure that the pancake doesn’t get too comfortable and refuse to let go once it’s time to flip it. Yes, flip it. It’s a directive that gave me a moment of anxiety—a not unreasonable reaction given the fact that no matter how perfectly browned and uniform the pancake may be at this point, screw up the flipping stage and it’s all been for nothing. That said, as outlined in the instructions, the process is manageable enough, and is achieved by simply sliding the pancake out of the frying pan and onto a large plate, then inverting the pan on top of the plate and turning over the plate/pan assemblage, so the pancake’s uncooked side is resting at the bottom of the skillet. Easy enough, though two things will help to assure your success: the first is using a nonstick pan, as previously mentioned; the second is working with something closer to a cake-plate than a dinner-plate, as the raised edge associated with the latter can interfere with the smooth transfer of potato to platter. Also, if possible try to use a plate that’s not too heavy as a smooth flipping motion will minimize the possibility of mishaps. In any case, once returned to the skillet the pancake needs a little more butter and another 15 minutes on the fire to complete the browning stage. Cut into quarters and voila you have the perfect hash brown. To enjoy the full rösti experience, though, lay a slice of speck (see explanation below) and the sliced cheese (not grated as shown; I was experimenting and found that sliced cheese does, in fact, work better) across the surface of the pancake and slide into the 300˚ oven for between five and eight minutes, or until the cheese is nice and gooey. 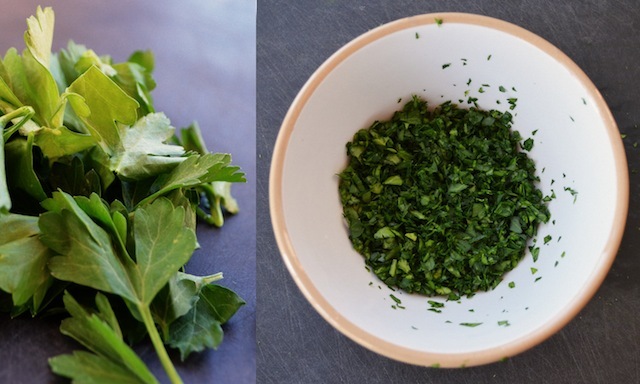 Remove from the oven, cut into quarters, and top with a fried egg and the parsley. Winter comfort, courtesy of Switzerland! 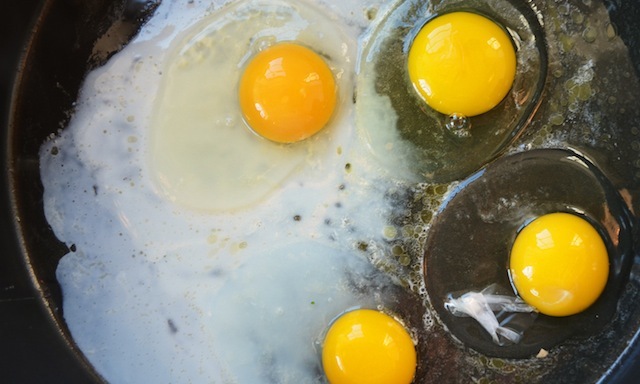 And one final note on fried eggs—another basic cooking skill I’ve always found challenging. The BA recipe includes standard instructions for this but as I rarely find the process to be as simple as presented I thought I’d include an alternate method (both are presented below), pulled from an earlier issue of the magazine. Here, instead of relying on the stove, the eggs are cooked (in a lightly oiled, nonstick skillet) in a 350˚ oven, an environment that seems to assure a more consistent temperature, and with it an egg that’s more reliably set where you want it to be set, and runny where you want it to be runny. 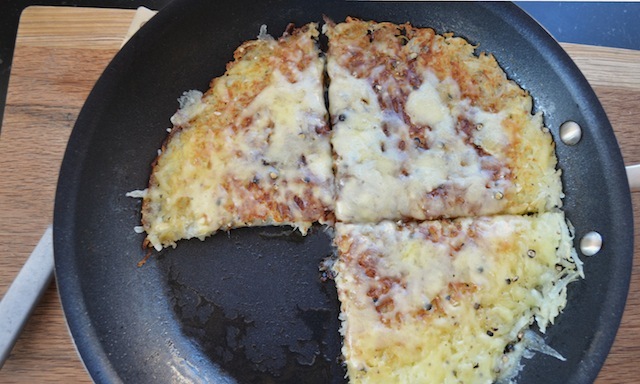 Of course, if you’re following this rösti recipe and only have a single oven, you’ll need to stick with the standard technique and hope for the best. It’s a nice to trick to have in your back pocket either way. Note: Speck is a kind of Tyrolian salt-cured ham that’s typically flavored with Juniper. It can be found at many gourmet markets, or here. 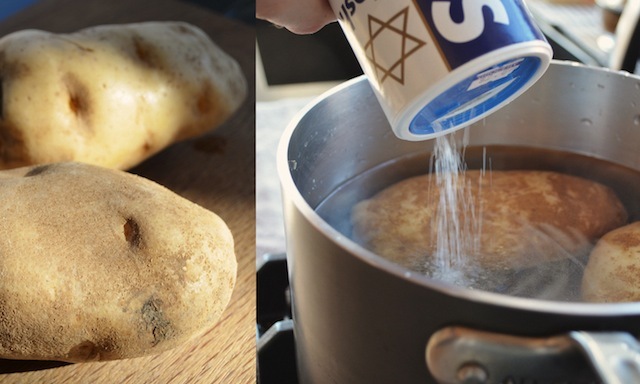 —Place potatoes in a large saucepan, add cold water to cover, and season generously with salt. Bring to a boil; reduce heat and simmer until the tip of a paring knife slides easily about ½” into potatoes, 8 to 10 minutes. Drain potatoes and let cool. Chill until firm, about 2 hours. —Preheat oven to 300˚. Peel potatoes. 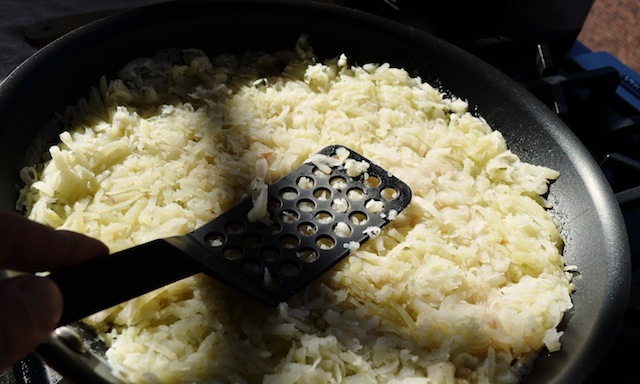 Using the large holes of a box grater, grate potatoes. —Melt 4 tbs butter in a 12” ovenproof skillet over medium-low heat. Add potatoes. Season with salt and pepper; press gently to compact. Cook, occasionally shaking pan to loosen, until bottom is golden brown and crisp, 15 to 20 minutes. 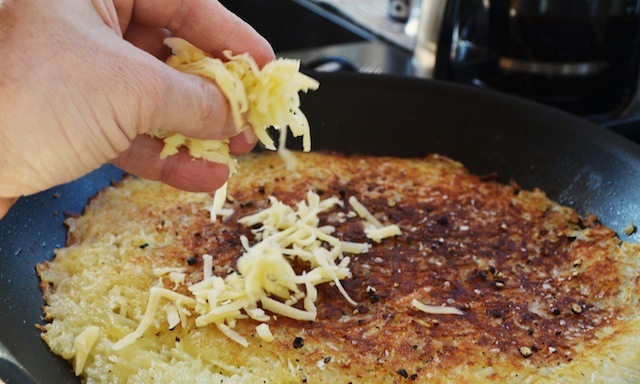 —Slide rösti onto a plate. Carefully invert skillet over plate and flip to return rösti to pan, browned side up. 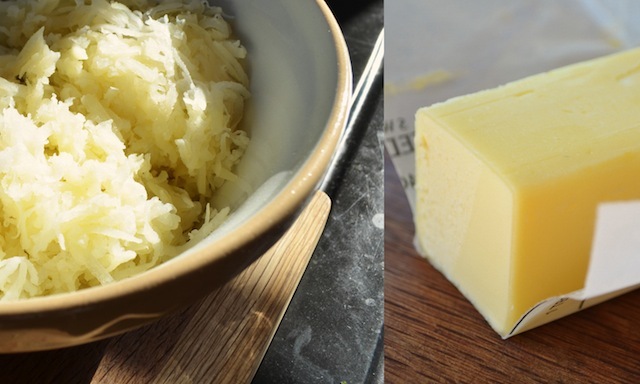 Dot 1 tbs butter around edge, allowing it to melt around and under rösti. Season with salt and pepper and cook until second side is golden brown and center is tender, 10 to 15 minutes longer. —Top rösti with speck (if using) and cheese and bake until cheese melts, 5 to 8 minutes. 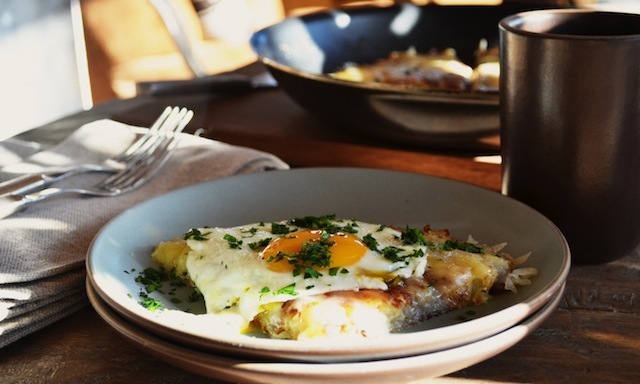 —Cut rösti into quarters, top with speck (if using) and eggs, and garnish with parsley. —Heat a lightly oiled nonstick skillet over medium heat. (Make sure skillet is ovenproof; not all are). —Crack eggs into skillet so they’re evenly spaced. —Transfer to a 350˚ oven and bake until whites are just set, about 4 minutes. —Remove from oven, season the eggs with salt and pepper, and slide out of the pan onto a plate.